You've known all along that you are ready for a long arm machine. Your priorities are obvious. You want a reliable machine with great stitch quality and local technical support. Handi Quilter has what you are looking for in a reasonably priced package. You can chose from sit down machines with 16 inches of arm length which are ideal if space is limited, to larger machines that can handle king size quilts. These machines are equipped with the best stitch regulators that automatically produce consistent stitch length and make you a better quilter right from the start. 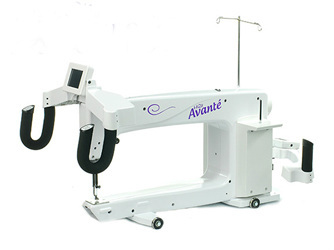 The optional Pro Stitcher makes the machine fully automatic for hands free operation. Check out the videos of the different Handi Quilter models. New Home Sewing Center is the authorized representative for Handi Quilter. We ship the machine of your choice to your home, assemble it, test it and teach you how to use it. We have a machine at our store, you are welcome to test it!